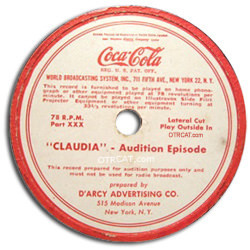 Claudia is an old time radio show about the ups and downs of being a newlywed. Topics include dealing with in-laws, burning dinner, losing socks, buying really big dogs, and all the little moments that make up a life together. 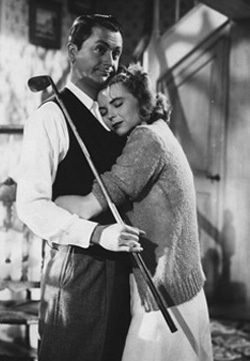 Originally originating as a script on The Kate Smith Show, the original roles were played by Patricia Ryan (Claudia) and by Richard Kollmar (David). The characters Clauda and David Naughton were created by Rose Franken who wrote a series of popular short stories about the fictional newlywed in the 1930s. The books were later adapted into 3 films by RKO. Due to the popularity of these films, Coca-Cola decided to sponsor a 15 minute weekday show. Staring Kathryn Bard and Paul Crabtree, Joe King is the announcer. Claudia is a lighthearted soap with relatable characters doing what regular people were doing. David is a WWII veteran trying to have a good life with his new wife and Claudia, although sometimes silly, is a loving wife. The show offers an excellent glimpse of a realistic 1940s American household. For another soap opera turned feature film, see also: Stella Dallas. I’m more into adventure and comedy than soaps, but I listened to the sample episode of, “Claudia”. And though not my normal fare, I think I’m going to like it. Kinda sweet, light, and charming. Addictive. My favourite OTR show of all time. If you listen daily, you\'ll feel like you know Claudia, David and Mrs Brown in a couple of weeks. I am very much enjoying the show too... one episode a day, like it\'s supposed to be heard. But my 21st century ears can\'t help but hear lots of passive aggressive banter between David and Mrs. Brown with some sexual tension there to boot. I know it\'s not meant to be there, but well... it just makes it all the more fun. Just goes to show you how messed up my modern mind-set is as I listen to this show.